Jango, an all-new brand of multi-activity bicycles powered by Topeak, launched in the U.S. and are available this month at 20 dealers nationwide in time for early spring commuting and touring. 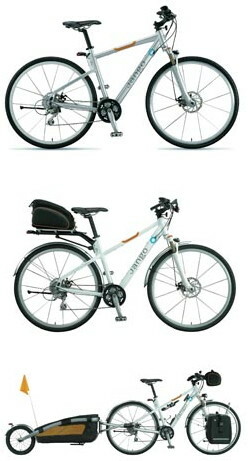 The first bicycle that uses a totally integrated design approach to maximize comfort, safety, utility, fitness, recreation and ecological benefits, Jango - inferring "change and go" - is an innovative line of bicycles featuring an extensive variety of exclusive plug-and-play accessories that are adaptable for road or light trail use. "The bike industry has complicated the buying process for consumers by developing models that only serve one purpose for either commuting, touring or trail riding. It's unnecessary and intimidating for most potential cyclists," said Neal Todson, President of Todson, Inc. who is marketing the bikes in the U.S. "Jango makes it simple by offering designs that are ideal for a wide variety of riding preferences from commuting to work, riding across the state or even taking it off road with a few simple adjustments. Jango makes cycling easy and fun again for the masses." Visually incomparable, Jango was developed by Topeak, an industry-leading and highly regarded designer of bike tools and accessories since 1991. Each Jango bike comes with 16 user-friendly ports that easily accommodate more than 30 (and counting) dedicated QuickClick and QuickTrack accessories, including bottle cages, fenders, child carriers, trailers, racks, lights, pumps and more. The innovative designs enable the user to quickly shift from shopping or commuting to recreation. Saddles, stems, grips, pedals and frame geometry are designed for maximum comfort and adjustability while integrated lights, locks and security features increase safety and security. "Jango is attractive for cyclists who want to face the down economic and environmental concerns head on," said Dave Groom, manager of Center Cycles in Auburn, the first U.S. dealer to carry the line. "The accessories make it the perfect bike for Puget Sound-area commuters looking to turn their bike into a gas-saving option or they can re-accessorize and use it for touring or fitness. Stripped down to the bare essentials it becomes a great tool for fitness and casual riding." Jango bikes are available at the following retailers: Greenwich Bicycles, Greenwich, Conn.; Ken's Bike & Ski, Davis, Calif.; Bicycles Unlimited, Greenfield, Mass. ; Edina Bike & Sport, Edina, Minn.; New Horizons Sports, Westfield, Mass. ; Sioux River Cyclers, Sioux Falls, SD; Cycles de Oro, Greenville, S.C.; High Peaks Cyclery, Lake Place, N.Y.; Center Cycles, Renton, Wash.; Orange Cycle, Orlando, Florida; Brands Cycle & Fitness, Wantagh, N.Y.; Main Bike World, Kingston, Penn. ; Pedaller Bike Shop, Lansdale, Penn. ; Mt. Airy Bicycles, Mt. Airy, Md. ; Emig's Bike Shop, Meadville, Penn. ; Scholls Bicycle Centers, Warrendale, Penn. ; Goodale's Bike Shop, Nashua, N.H.; Zane's Cycle, Branford, Conn.; Free Flite Bicycles, Marietta, Georgia; Rapp's Bicycle Center, Butler, Penn. To see the entire Jango collection and accessory line visit www.jangobikes.com.